Welcome the Koprulu sector. You are Jim Raynor, and you're on a crusade to bring down the Dominion and its nefarious leader, Arcturus Mengsk. Haunted by betrayal and remorse, some believe you've given up the fight. But you have promises to keep – and a need for vengeance that’s long overdue. Whether you command the mysterious Protoss, the nomadic Terrans, or the ruthless Zerg, you must decide how to outwit or outgun the enemy in an unforgiving universe of intense strategic combat. Devise and deploy merciless strategies with over 30 new units and weapons at your command. Torch foes with the Hellion’s flamethrower, ambush adversaries with acid-spewing Banelings, or deploy the Void Ray’s prismatic beam to annihilate your enemies. Whether cheering on the underdog or rooting for a fan favorite, millions have experienced the thrill of battle and the rush of victory through StarCraft's vibrant eSports community. Now it's your turn. With all-new single player missions, you'll lead the Terrans across the galaxy in a quest for glory, redemption, and revenge. You choose which missions to take, which storylines to complete, and where to invest your hard-earned cash. With the included StarCraft II Editor, you can create your own campaigns, maps, and mods. Share your creations on Battle.net, and experience what the StarCraft community has to offer! As Queen of Blades, Sarah Kerrigan, you were once the most feared entity in the galaxy. Now, you wait in a cell in the depths of a high-security research laboratory. Before the murderous forces of the Terran Dominion close in, you must plot your escape to the dark reaches of space – and reclaim your living empire at the Heart of the Swarm. Incinerate advancing foes with the Hellbat, seize air superiority with the Tempest, engulf entrenched enemies with the Swarm Host, and more with seven devastating new units. Embark on a path of furious vengeance in a brand new campaign centered around the Zerg. Unlock Kerrigan’s powers in 20 new missions, and swarm from planet to planet aboard your moon-sized zerg Leviathan. Special Evolution missions allow you to evolve your brood for maximum devastation. You will choose how the Zerg should adapt to best conquer all in their path. All things must come to an end —— but with the psionic power of the Protoss on your side, fear is an illusion. 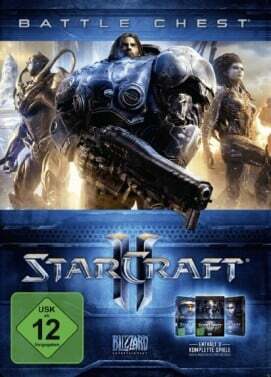 Guide the Protoss as they struggle to unite the three races in the ultimate battle for survival against an ancient evil threatening all life in the universe. Experience the epic conclusion to the StarCraft II trilogy and find out who perseveres in the face of adversity. With the cooperative Archon Mode, you and a friend share control over a single base and army. Develop detailed game plans and focus your attentions to take down your adversaries. With the Allied Commanders cooperative mode, join forces with a friend and take on the role of a StarCraft commander as you battle through scenarios, level up, and show off your real-time strategy skill in a team environment. Purchase Legacy of the Void and gain access to Artanis when he enters the Nexus. Uphold the honor and glory of the Protoss and brawl it out in Heroes of the Storm! Explore the strategic depths of the game with six fresh units -- two for each race -- and enjoy new abilities for the units you already know and love. Whether cheering on the underdog or rooting for a fan favorite, millions have experienced the thrill of battle and the rush of victory through StarCraft's vibrant eSports community – now it's your turn. Legacy of the Void includes 4 new Allied Commanders, so you can jump into co-op missions ready to win. With Protoss weapons expert Karax, chief Terran engineer Rory Swann, Zerg broodmother Zagara, and masterful Protoss warrior Vorazun to choose from, you're sure to find a Commander that suits your play style.